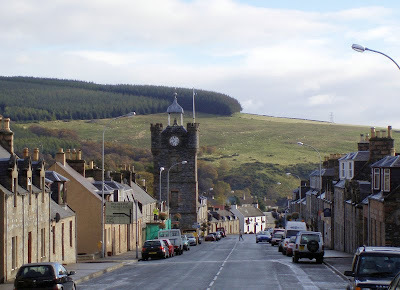 The northeast - Moray and Buchan - is an area of Scotland I have only been discovering in the last few years. Growing up in Glasgow and fixated on the Munros, for me 'the east' started at Ben Alder and ended at Mount Keen. The A9 was the eastern limit of anything of interest between Aviemore and Inverness. (I once fell into conversation with an easterner from Grantown on Spey who indignantly informed me he was from the middle of the country.) Downstream of Abernethy forest on the Spey, or Balmoral on the Dee was an unexpolored country - 'here be flatness'. But this previously neglected northeast is not flat, except on the Moray coast. It is a land of dark rivers and many hills, albeit lower and more rolling ones than the recreational Highlands. These are working hills. 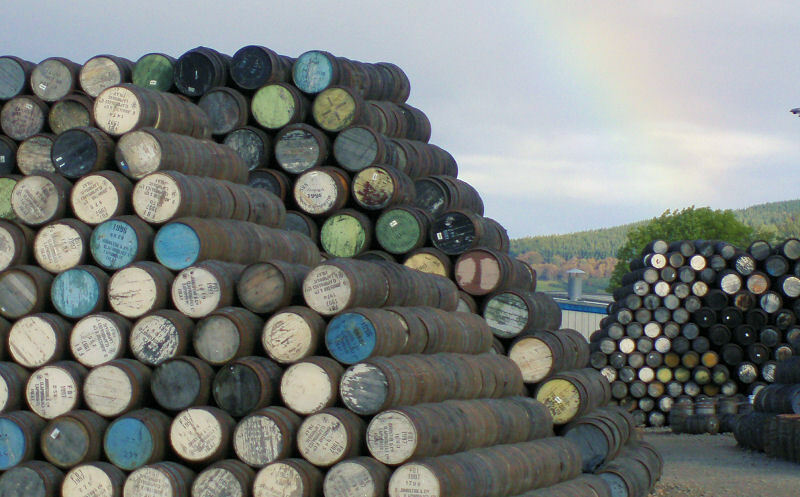 These are whisky hills. And some of these hills are interesting hills. Tap o' Noth with its vitrified fort. Bennachie, one of the most distinctive hills in the whole country. And the isolated Corbett (aren't they all?) of Ben Rinnes. Ben Rinnes is an easy ascent from the northeast, the most common route if erosion is any guide. 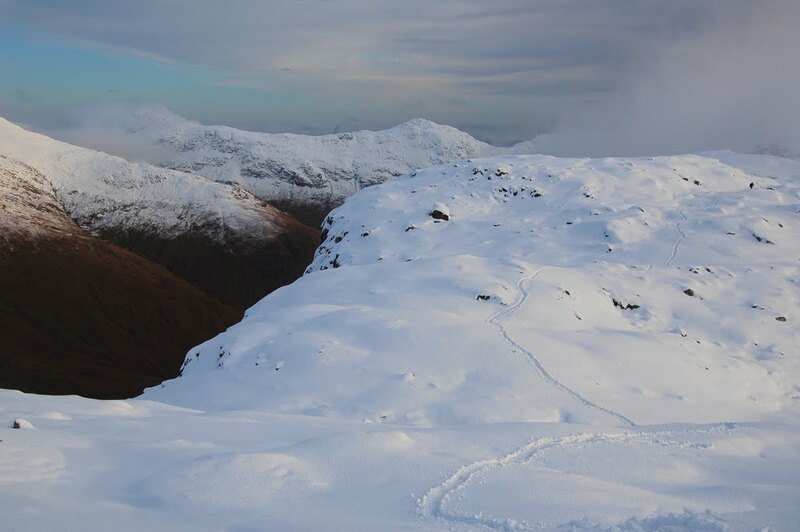 The best route however is to ascend the northwestern ridge and its little tor, before descending via the northeast. After Ben Rinnes, I decided to explore the area by doing a circuit of the hill. 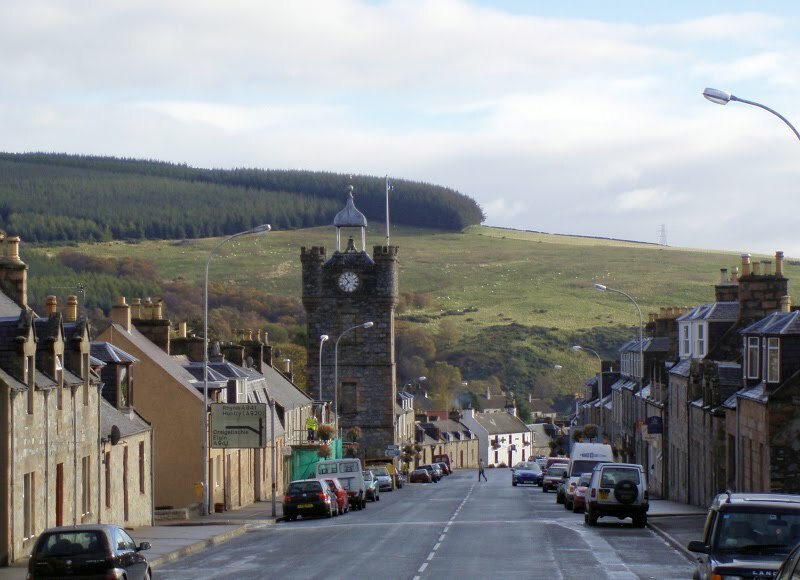 Dufftown, the town 'built on seven stills' is nearby. Next to Glenlivet is a spot I had never heard of, Bridge of Avon. This beautiful bridge is the gateway to Ballindalloch Castle. The trail follows St Cuthbert's Way, then a route to Edinburgh I don't recognise, the lowland canals, the Rob Roy Way, the Corrieairack to Fort Augustus, then disappears into trackless country in the northwest. It was with surprise I realised I've already walked the majority of the way from the border to Cape Wrath, albeit in installments and by a different route to the proposed trail. 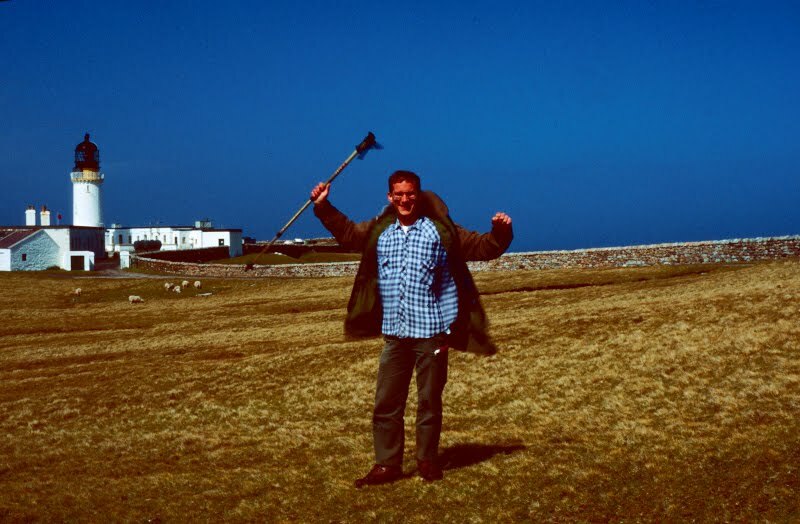 I've walked the Berwickshire coast and John Muir Way as far as Aberlady, the Union and Forth-Clyde Canals between Edinburgh and Glasgow, Glasgow to Milngavie, the West Highland Way to Fort William, and from Ardnamurchan to Cape Wrath. 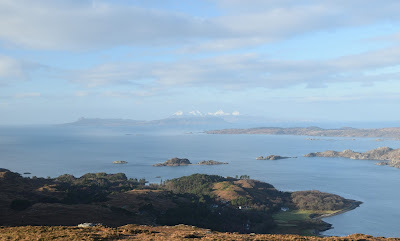 The only gaps in my own route are from Aberlady to Edinburgh, and from Fort William to Ardnamurchan - Ardnamurchan being, as I described before, a superior starting point to Fort William for the route to Cape Wrath. It can happen. The bothy you have just walked in to in the dark and rain is a roofless ruin. There is nothing to be done except walk back out again to the road, a full rucksack and a night's worth of peat chafing at your shoulders, the rain dripping down the back of your neck. 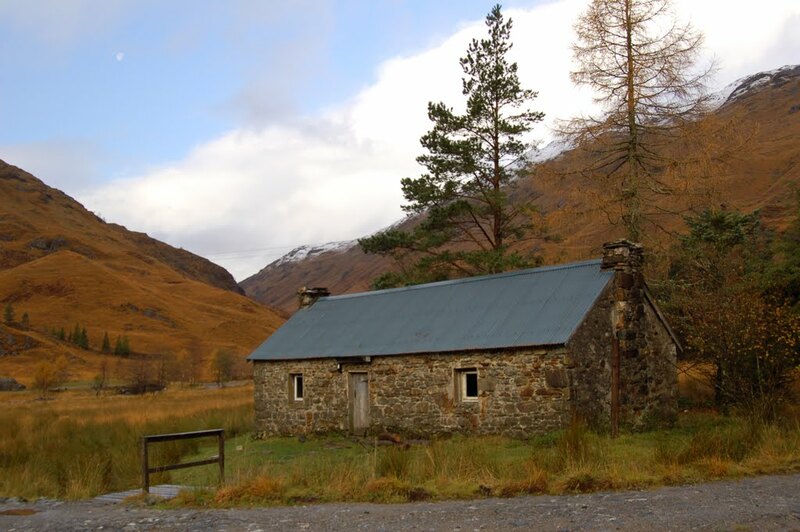 Fortunately there was another bothy nearby. A draughty one, but one with a fireplace and, we were glad to discover on arrival, a roof. The heart of any bothy is the fireplace. 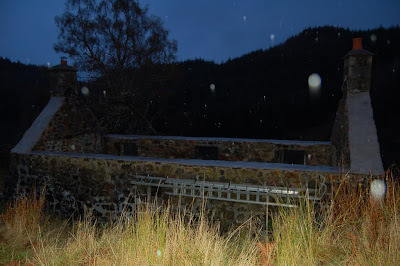 By daylight, a bothy is a cold and dirty hovel. But darkness hides the dirt, and the fire brings life and warmth, drawing in people around it. A bothy at night is a convivial gathering of story telling, contemplation, of getting away from it all, staring at the magical flames. Next day dawned grey and wet. We prevaricated before setting off. I desperately wanted a winter hill as I hadn't used my iceaxe for the whole of last season, but the conditions were uninspiring. We trudged up the hill, a Munro, through rain and bogs. 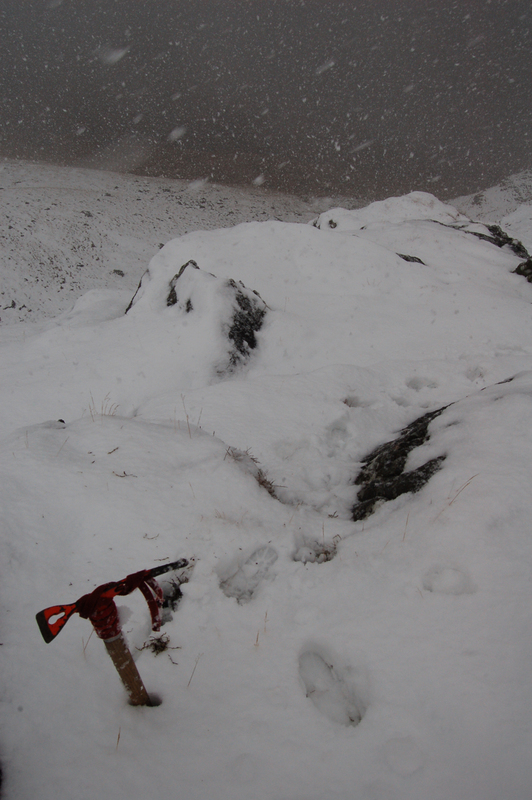 About 400m up we entered the cloud, and the rain turned to wet, slushy snow. Goodbye views. I got my axe out, even though it wasn't really necessary. The sound of axe metal chinking on rock. We argued about where we were. About 800m up, I thought. No, said a companion, only about 600m, and they were right. This was taking ages. Maybe we would even turn back. At this rate, I would certainly be soaked before the summit was reached. 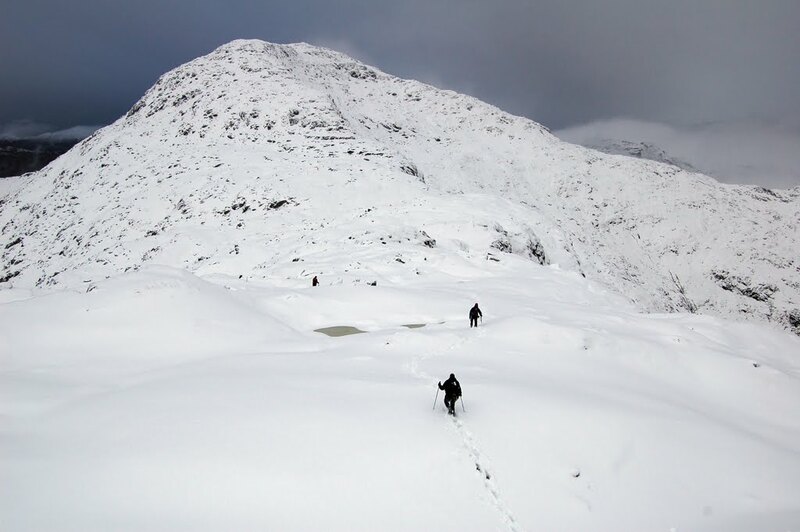 The hill steepened in white blankness before us, and everybody unfurled their axes. And then something amazing happened. The snow stopped falling, and, slowly, the clouds started to clear. 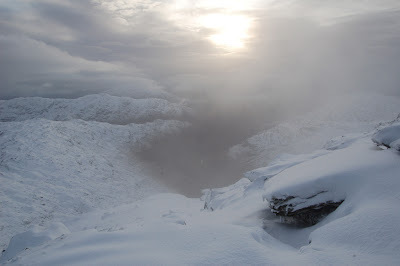 We were still fairly far from the top, but re-energised. This was turning into a beautiful day! In summer, a hill is climbed by following a path. Even if that path is nothing more than a faint muddy line, we still follow in footsteps of others. But with every fresh snowfall, the same hill becomes virgin territory. What a day this had turned out to be! We reached the summit at 3pm, the Cullin of Skye and Ben Nevis grey but visible, shafts of sun through high clouds on a few hills, lower clouds wrapping others. A pair of ravens circled us as we descended, snow briefly glowing orange as the short winter day came to an end. My walk of the year so far. Earlier, I posted about investing in an NTS season ticket, and how this would lead to a flurry of National Trust related posts as we spent our weekends visiting houses and gardens across the country in a concerted campaign of getting my money's worth. But now, suddenly, without us going anywhere all year, our membership has nearly run out. 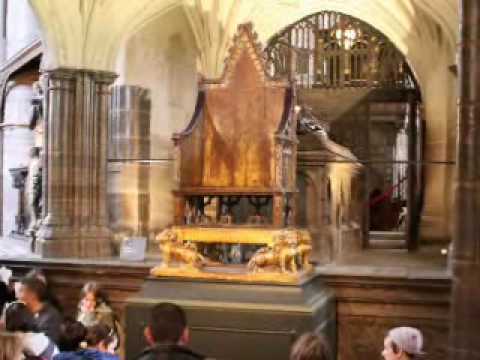 At least the money has gone to a good cause (unlike, say, an unused gym membership) - preserving the nation's heritage. So time to plan. I've always wanted to see Craigievar. But then I discovered it was closed for the season already! But at the weekend we finally made it somewhere, at - and this is the important bit about a season ticket - a saving of £2 for car parking and £11.50 per adult. Fyvie on a Sunday was the haunt of pensioners, the last tourists of the season and families with well-wrapped toddlers, enjoying some late season sunshine. The estate has a pond with ducks, waterfowl and a viewing hide. I wanted to look at the River Ythan too to get an idea of the defensive situation of the castle, but the Ythan is a small burn at this point. Like many other areas in the 18th century, the surroundings were drained and improved from swamp to parkland. And thir three stanes ye'se never get. 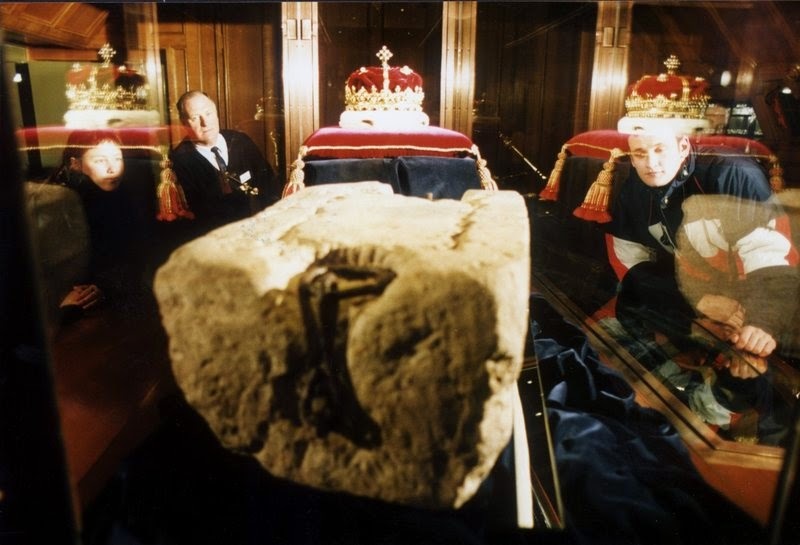 The 'stanes three' were supposedly parish boundary markers removed from their sacred sites for the building of Fyvie. They can't be accessed unless the castle is dismantled - and as the 'water yett' is supposedly the River Ythan - there is no hope for the house of Fyvie. Perhaps this is why it has passed through the hands of so many families. Probably the castle's most impressive feature is the great stair, vaguely reminding me of the spiral ramp in Chateau Amboise on the Loire. The ramp at Amboise was designed for cavalry to access the town from the chateau, so it was no surprise to discover that the Gordon family, who took over Fyvie from the Seton family who built the staircase, habitually rode their horses up it, racing each other to see who could get to the top first. And what a top! The gallery in the top floor is bathed with light, with 17th century ornament, an organ and a beautiful baby grand piano. My fingers itched to play it... this room can be hired for weddings. According to the guide, somebody had been married here just the day before. I hoped the marriage would prove happier than that of Lillias Drummond, who in 1601 was starved to death in the next door Douglas Room by her husband Alexander Seton for failing to produce a male heir. With actions like that, it sounds like the house of Fyvie deserved not to thrive.